Longtime radio broadcaster and ASA member Jim Foley, who has been with the Houston Rockets organization for 36 years, is resting comfortably after having bladder surgery on March 24. Foley took a leave of absence after the March 18th game when the Rockets' monumental win streak ended. "This is not the way I wanted to say farewell," said Foley, who announced last June that this would be his final season. "I am sorry to be leaving at this exciting time, but I am hopeful that an extended playoff run will enable me to return for some games, and I have every confidence that this will happen. I could be back in early May." Foley, 68, in his 39th NBA season, came to Houston in 1972 as the team's director of public relations and moved over to a full-time radio analyst's position in 1987. "A lot of what I learned about pro basketball, I learned from Jim," said fellow ASA member Bill Worrell, the TV play-by-play man for the Rockets and a longtime friend. "Between Jim and (former team president and general manager) Ray Patterson, they held this team together and kept it in Houston through those early days of selling pro basketball in this market. "On the road, we call him Foley.com, because he doesn't use a computer but has a library full of facts in his head. But what's always impressed me the most is that I've never been able to walk into a bar or restaurant anywhere in the United States where Jim doesn't know the bartender on a first-name basis. He just enjoys people." Rockets radio studio host Craig Ackerman, who has filled in for Foley and play-by-play man Gene Peterson, will serve as the team's color commentator until Foley's return. "Jim's been like a brother to me," Peterson said. "In my 45 years of broadcasting, he's the partner who moved right in, and we picked up the beat from the first day, and it's been like one long, fun conversation. I'll keep him in my prayers and hope to see him back alongside of me in the playoffs." 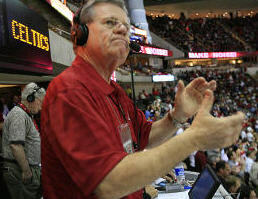 Fans may send greetings for Foley to the Rockets' offices at Toyota Center, 1510 Polk, Houston, Texas, 77002. "This is obviously a very difficult day for our entire organization," said Rockets owner Leslie Alexander. "Jim Foley is synonymous with Rockets basketball, and I know that leaving the team during such an exciting time is very difficult for him. "No one has enjoyed this magical run more than Jim, and we are very hopeful he will be able to rejoin us for what promises to be one of the most memorable Rockets seasons ever."